Are you looking to implement some of the most attractive types of soft landscaping to improve the appeal of your property? If you are, then you need to call the friendly and knowledgeable team at Abbey Turf today on 02380 812 302. We are the premier bark chip suppliers Romsey has to offer, so get in touch and let us know how we can help transform your property’s gardens. When it comes to choosing the ideal bark chip suppliers in Romsey can provide, it always pays to ensure you use the most experienced and courteous team. In this respect, you will be pleased to know we have narrowed down the logical choices to just one; Abbey Turf. 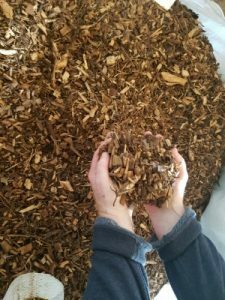 Bark mulch and bark chippings are some of the most decorative additions to any garden, which is why we take care to only use the highest quality bark for our products. There are so many benefits to having bark from our bark chip suppliers Romsey, beyond just being great to look at. If you want a healthy and more easily maintainable garden, then our bark chip suppliers Romsey can provide premium quality chippings and mulch that will help. One of the most obvious benefits of bark is that it covers soil and provides a cleaner alternative for pathways and such. Many plants that are not native to the UK can be affected by the abrupt changes in weather conditions, such as the constantly heating and cooling of the soil. Our bark chip suppliers in Romsey will help by providing the highest quality bark to cover the soil and help regulate the temperature. On top of shading the soil, our bark chip suppliers in Romsey will give your garden the ability to fend of weeds more effectively as well. This is achieved by limiting the amount of light that reaches the soil directly, which starves the newly growing weeds of vital sun light. Additionally, bark is a completely natural product and it will break down and decompose over time. This decomposition will add nutrients to the soil, so our bark chip suppliers in Romsey can help you garden become more luscious than ever before. If you would like to have the products from our bark chip suppliers in Romsey implemented by experienced professionals, and other changes, then our landscaping services are perfect for you. Whether it’s hard or soft landscaping, or a combination of the two, we can transform your garden in a stunning haven. Why Choose Our Romsey Bark Chip Suppliers? Here at Abbey Turf, we have over 25 years of experience as a family run business. We use our family values to provide our customers with unrivalled service and only supply products that are up to our strict standards. Thanks to this, we have gone from strength to strength and now have a far spread loyal client base. Whether you are in need of landscaping services, premium quality turf, top soil, or bark chips and mulch, we won’t be beaten for results at such competitive prices. We are the only bark chip suppliers that you need to call for all your garden needs. If you would like to know more about Abbey Turf itself or any of our services and products, call our team today on 02380 812 302. Alternatively, you are welcome to contact us in writing by filling out the online form on our easily navigable website. There is also the option to email us directly by sending it to info@abbeyturf.co.uk.